The first in an upcoming series of family history books written by long time family history blogger & researcher, Gwen Tinker. This volume covers the authors Maternal family history. Starting with her mother and working her way back in time to her Great Grandfather, John Henry Esterline. John Imigrated to America in 1836 and settled in Spencer County, Indiana. John married Mary Ann Miller and had several children. After leaving Indiana in the late 1800`s, the family moved to Southeast Missouri and settled in a little town in the Bootheel, called Bernie. It was there that John Wesley Esterline, son of the Immigrant, raised his family. There are many Esterline descendants still living in the area. Family photographs,historical information and stories are included in this book. 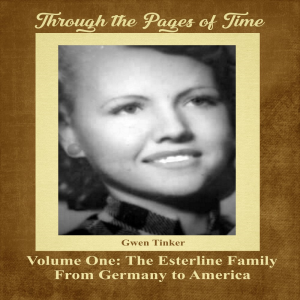 The family is described through the eyes of the author, who strives to give the reader a glimpse into the Esterline family lineage.